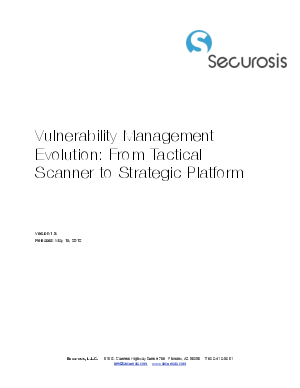 Organizations have traditionally viewed vulnerability scanners as a tactical product, largely commoditized and only providing value around audit time. But with limited resources and a real need to reduce risk, organizations need the ability to pull in threat-related data, combine it with an understanding of what is vulnerable, and figure out what is at risk. Learn how vulnerability scanners are evolving to provide real value beyond vulnerability reports for auditors - emerging as a strategic component helping organizations effectively lower risks.